***I participated in a campaign on behalf of Mom Central Consulting for Welch's. I received product samples to facilitate my review, and a promotional item as a thank you for participating. All photos below are copyright Momma Told Me Blog 2013. 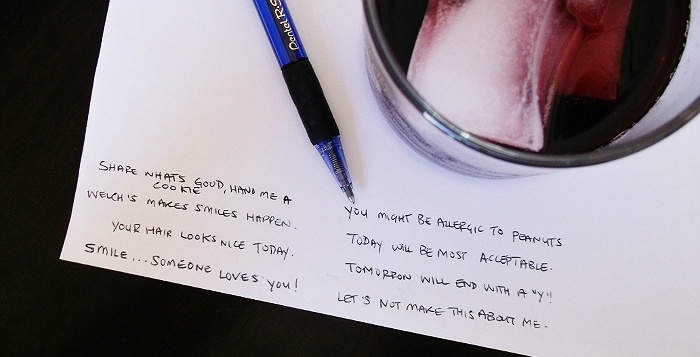 Momma Told Me: A smile is the most important thing you'll ever wear. Not too far away- Okay, years back, amidst the flurry of my childhood, Momma and I ruled the kitchen together. I remember the first time I discovered Bagel Bites, somewhere around 1995- I didn't stop singing that darn jingle for months. And, just when I was certain mom would ban the word 'pizza' from our home, all-together, she surprised me with a stroke of culinary genius. With a firm hand on her hip, floral print maxi dress, and a look of determination, she smacked the frozen food box on the counter and looked intently in my eyes, "We can make these! And we can make them any way we want to- and they'll be much better!" she declared. I was a bit afraid, and a bit excited, all at once. Momma's culinary creations were usually hit or miss- and I didn't want to have to choke down any more misses with a pained grin. But, as it turns out, this tale marked the beginning of a weekly tradition Momma and I kept for several summers. We'd begin our week with a trip to the local bagel shop, then stock up on ingredients during the mid-week grocery trips. And every Friday would be Bagel Pizza lunch day- a magical event of olive fingers and sassy saucing that still brings a smile to my face today. These were kitchen table moments elevated only by the slow sipping of ice cold grape juice; Welch's a staple in our household. 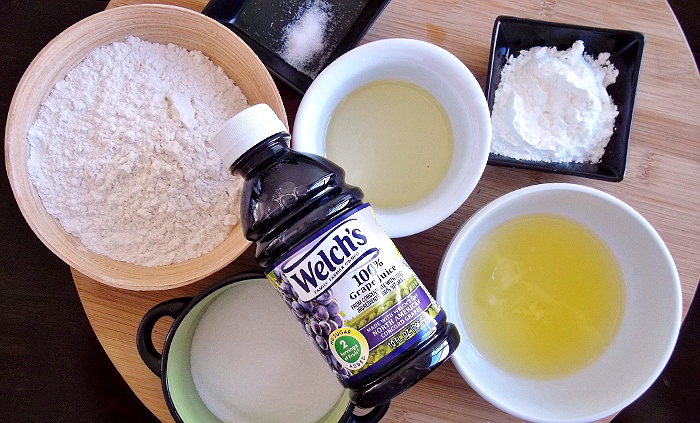 So, it's no surprise that Welch's has recently launched a #ShareWhatsGood campaign and photo contest to help capture and share those very treasured kitchen table moments. Of course, 'what's good' doesn't have to happen around the kitchen table, Welch's knows these moments can happen on the go, and with friends too. So, in addition to the exciting Share What's Good contest, they've worked tirelessly to bring you a collection of recipes and family activities to spark your next 'what's good' moment. 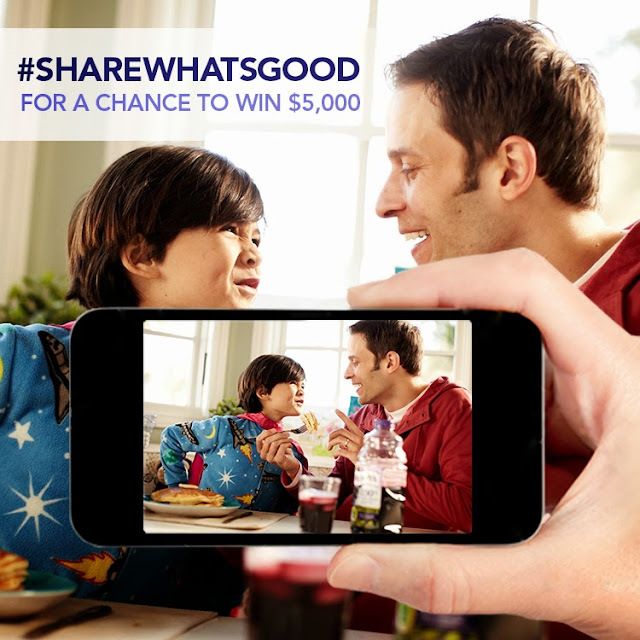 Log on to Welch's Share What's Good page today to find out how to get entered to win $5000! 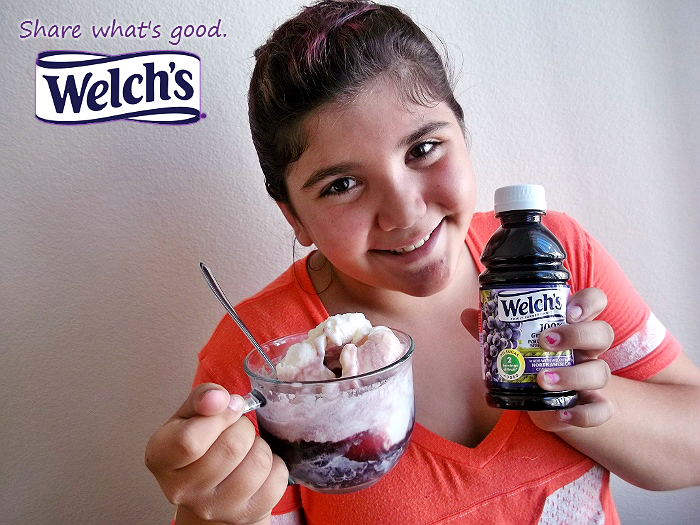 Our family jumped at the chance to create some of our own special moments with a little Welch's inspiration. 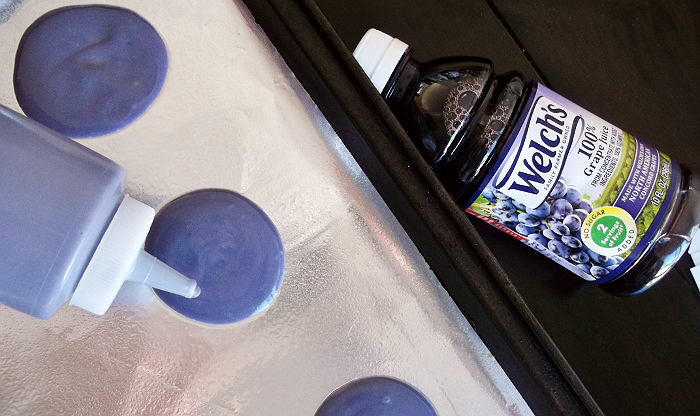 Armed with Welch's 100% Grape Juice, we created some instant memories, and I even got to 'steal' come precious family time without them noticing! 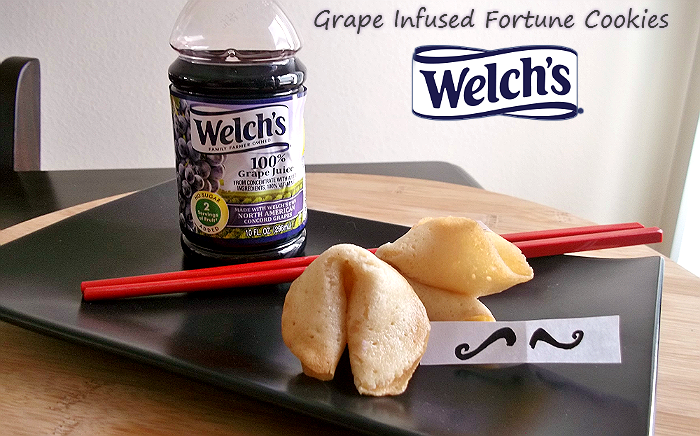 In fact, we used the Grape Fortune Cookie recipe fround on the Welch's website to create the header photo for this post, my very first entry into the #ShareWhat'sGood contest. I'd made fortune cookies years ago, but was inspired by the thought of adding a touch of grape juice to enhance the cookie's flavor. 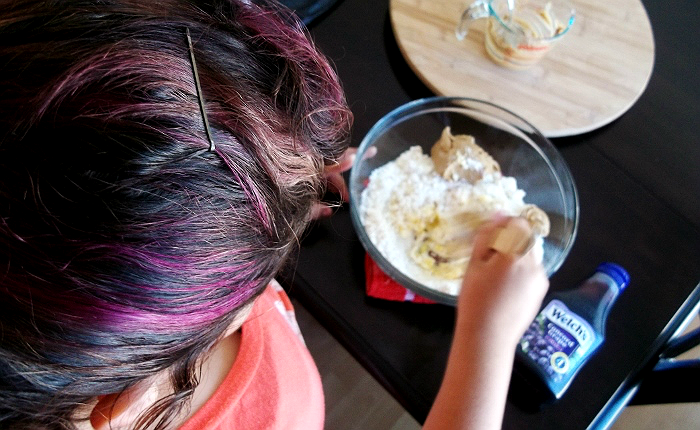 This was the most hands on project, and Sabrina (11) quickly became engulfed in the task of rolling out the 'dough,' and learning how to fold the hot cookies. This time, however, writing the fortunes was left to me; imagine Sabrina's delight when she pulled a cartoon mustache out of her first one! 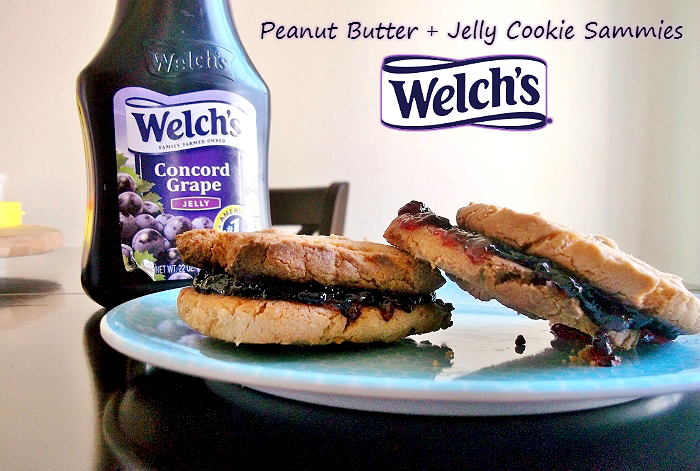 Because part of 'what's good' to our family is classic comforts, filled with childhood memories, we immediately wanted to make Welch's Peanut Butter and Jelly Cookie Sammies. With a simple recipe, that includes a bagged sugar cookie base, even the most amateur of home bakers can pull this one off. 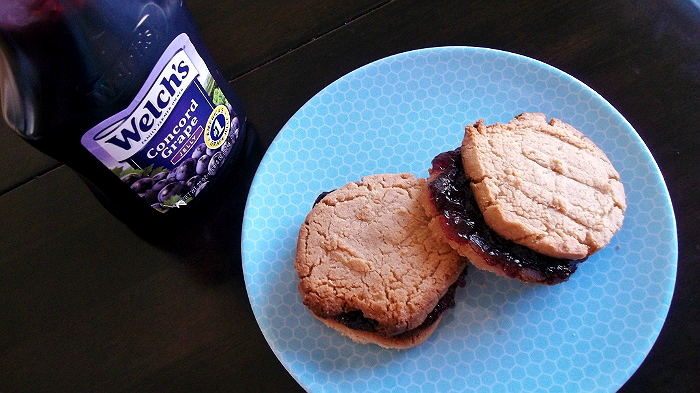 Not intended for the faint of heart, or those with white carpeting, these peanut butter cookies wedged a hefty helping of Welch's Concord Grape Jelly between them for a new twist on a classic childhood favorite. Both Jay and Sabrina gulped these down with a tall glass of milk. Not only were these creations perfectly messy, but the jam smeared smiled of my loved ones made for yet another 'what's good' moment. Honestly, anytime the family comes together in the kitchen, it's magical. 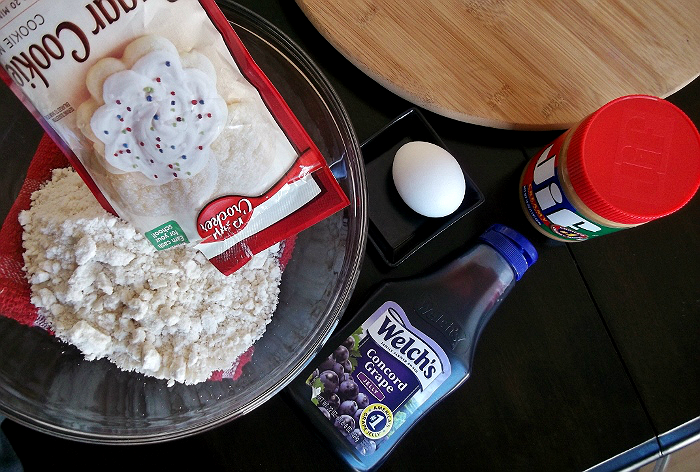 I was further browsing the Welch's website last week when I came across yet another, simple, Welch's twist on a classic treat. Ever since our Fortune Cookie endeavor Sabrina (11) had been requesting Welch's juice after school. I decided I would surprise her with a Purple Cow Float- Okay, a what? 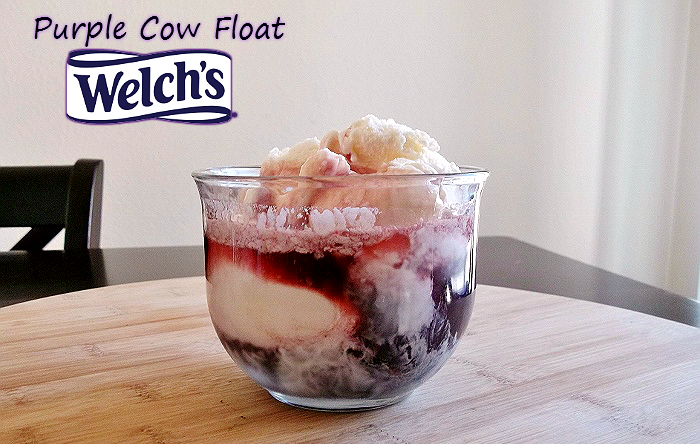 That's right, chilled grape juice poured directly over 2 heaping scoops of vanilla bean ice cream for a creamy, yet slightly tangy, float that is free of carbonation mishaps, and resembles a Purple Cow. This got giggles right from the get go, as purple beverages, let alone desserts aren't very common! With a hesitant sip, Sabrina nodded in approval, a frothy smile clinging to her upper lip, 'That's good! What's in it?' Here she was thinking I'd crafted some fancy new drink, and I'd only used two ingredients. Two simple ingredients for yet another What's Good moment. Log onto the Share What's Good website, or follow the brand on their official Facebook page for more great family time inspiration, and delicious Welch's recipes. 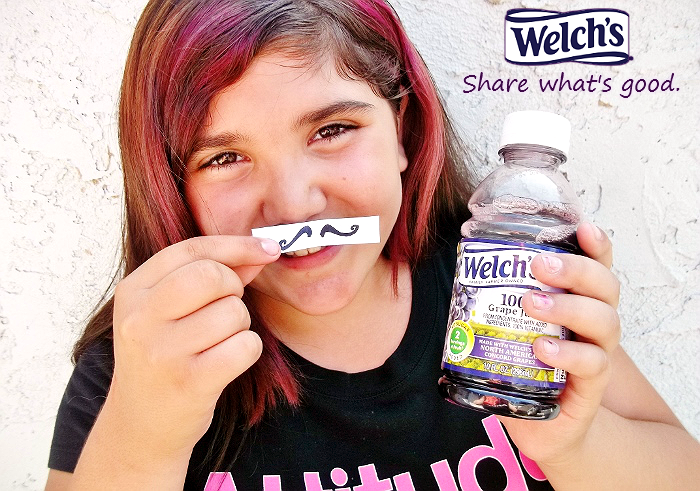 Entering the contest is as simple as adding the #ShareWhatsGood hashtag to your photo upload on Twitter or Instagram, and be sure to follow @Welchs on both channels to stay on top of all the adorable submissions. For me, the small moments are often the best, and they're the easiest to overlook. Spend some time to pause and reflect on the 'what's good' moments of your life this week, then remember to open your eyes- the list of moments should always be growing! What is one of your favorite 'What's good' moments? What Daughter Says: Share what's good in your life, and brighten someone else's day. Smile's are contagious. What's good... I'm very lucky to have my dream job doing what I love. I'm so lucky to have my health, my faith and my family. I'm happy to be able to do both my day job and blogging. I never thought to make a float like that. WOW, your food and food photography just blows my mind! Seriously they all look absolutely amazing! yum! So what makes me smile. Seeing my daughter on her horse today overcoming her fears and breaking through with her developmental delays. That was a huge feat today and had me all smiles! TO have my mom being more healthy! Now I have to slow my blogging and spend more time with her! Sharing ice cream with my kids on a hot summer day is a favorite feel good moment for me. PS Those fortune cookies look AMAZING!! Our good times center around the garden. We can spend a lot of time out there, we can even graze if we get hungry! :) We just picked 5 5gal. pails of apples! Yum!